Series Overview How do we set the foundations and conditions for our students to experience mathematical empowerment? How do we translate new shifts in math that are focusing on fluency, mastery and proficiency? What does (or could) it look like in the learning adventures of our students? What questions still linger within our own practise? Given the unique profiles of all of our learners, navigating ‘how’ new shifts in math might look when implemented are BIG questions which we are often left to tackle alone -- but it doesn’t have to be a path we walk alone! This series is intended as a ‘book-club format’ in which the focus is an invitation for groups of teachers, educational support staff and coaches within grade level/districts to meet once a week to co-learning/reflecting (and unpack) some of these new directions in math teaching and learning together. While each session is distinct in content, each webinar builds on the knowledge gained and questions posed by participants in the previous session. Prior to each session, groups will be given reflection questions to unpack together as well as resources (and homework) to share with group. The purpose of this PD is to honour and cultivate powerful teacher reflection and be responsive to unique needs of ‘Teacher learners’ across schools. All shared ready-made and user-friendly curricular materials, lesson plans, videos, resources, and activities will be curated and tailored based on feedback/questions/curiosities from PD groups. 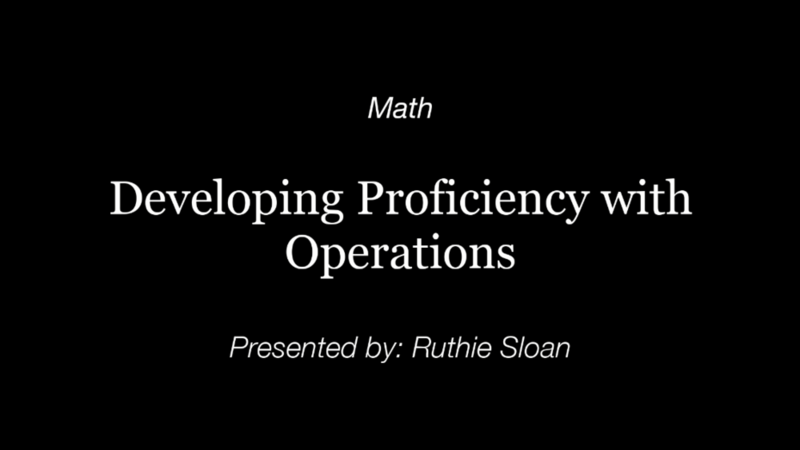 Developing Proficiency with Operations: Putting the Pieces Together to Empower Critical Math Thinkers - Webinar 5 will cover the following: •	Understanding what proficiency with operations is and how it connects with other big ideas in Math Fundamentals document •	What proficiency looks and sounds like across age/grades •	Understanding ‘concreteness fading’ and relationship of manipulatives to building epic visualization powers Reflecting on: * •	What qualities/habits help teachers empower their students to develop proficiencies in operations? * •	Investigating and experimenting with resources that help students build language of thinking, and communicating math ideas. Amazing learning experience while sitting at home! * •	What qualities/habits help teachers empower their students to develop proficiencies in operations? * •	Investigating and experimenting with resources that help students build language of thinking, and communicating math ideas.